How to create Mobile SDK survey? 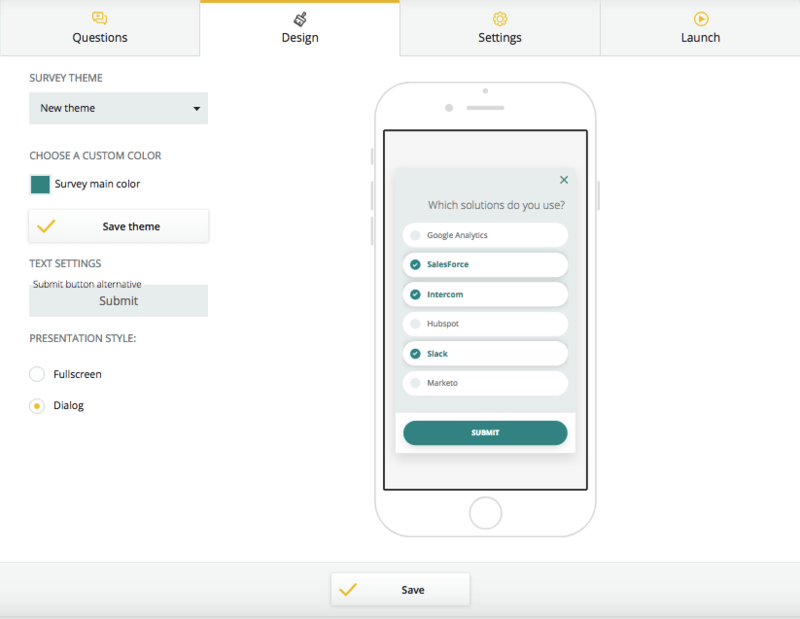 You can now conduct mobile UX tests and inquire about who your clients on mobile devices are and what are their main pains, needs, and goals during the use of your app. How to install The Mobile SDK in your app? Click on Create new survey then select Start from scratch > Launch in your mobile application and name your survey. 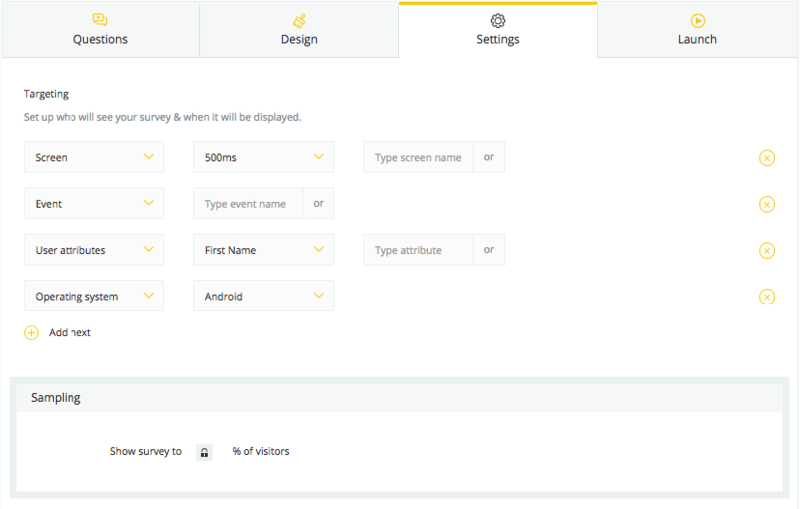 In the Design section, you can change the main survey color, text on the Submit button and choose whether the survey will be displayed as a dialog window or in a full screen. In the ⚙️Settings tab of your survey, you can choose the conditions that need to be matched to display a survey. You can apply several values for each condition- the survey will appear if any value is matched. ❗️Between different settings there is AND condition. Meaning if you choose Operating System: iOS and Language: English the survey will be displayed only to English iOS users. Screen is the screen that the survey should appear on and time the user needs to spend on it. Pick the time after the survey is displayed in Delay field and write the names of a screen inside your code in the proper field. Event displays a survey upon completing certain actions. Write the name of the event in the corresponding field. User attributes targets only those users, that have certain attributes assigned. Pick the type of the attribute and write it. Remember that your developer needs to modify a code to assign attributes to specific respondents. You can also see the option to sample users- target only a percentage of your traffic. Your new mobile survey is now live and the feedback is being collected!